The release of documents containing the names of hundreds of prisoners held at the Guantanamo Bay camps represents a significant blow to US government secrecy surrounding the controversial facility in Cuba. The documents - transcripts from the combatant status review tribunals (CSRTs) held to assess detainees' status - are being released now after the US government lost a court challenge against a request lodged under America's freedom of information act. Because the latest transcripts run to several thousand pages, it may take days for them to be read and fully analysed. But human rights activists say this new information should make it easier to piece together the personal histories of the detainees - and for the first time to build a big picture of who is held at the camps, and why they are there. What the documents do not do is shed light on speculation that there are other prisoners, known as "ghost" detainees, at the camp. If a prisoner at the camp has not had a CSRT they will not feature in the transcripts. And while there are about 490 people currently held at the camps, the latest documents contain the summaries of only about 320 CSRTs. Yet the release of the names still represents a lifting of the veil of secrecy that has helped create so much suspicion about US operations in Cuba. Guantanamo Bay was set up to be a secret centre to gather intelligence from "enemy combatants" in the "war on terror", outside the jurisdiction of the US courts. But the Bush administration is having to fight an increasingly bitter battle over its legal arguments for the extra-judicial status of the camp and its treatment of current prisoners. Pentagon and US Department of Justice officials had objected to releasing the names of the detainees, citing privacy concerns and arguing that terrorist groups might attack the prisoners or their families. The judge in the case ordered the Pentagon to ask prisoners if they would consent to their names being published. Of 317 detainees who received a form with this question, 63 said yes, 17 said no, 35 returned the form without answering and 202 did not return the form. He ruled that the small number of negative answers did not justify withholding all the names, and also said the Pentagon had offered only "thin and conclusory speculation" to justify its security concerns. Much is already known about who is in the camps because of the fact that some of the detainees have lawyers and are contesting their continued detention without trial in American courts. In recent weeks there has also been increasing international pressure to close the facility which has become a potent symbol for anti-US sentiment. 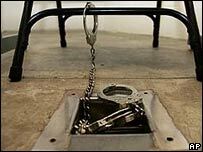 A scathing United Nations report said in February that treatment of the detainees amounted to torture and called on the US to try them, or free them "without further delay". 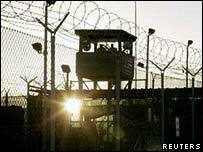 Yet despite such attacks, the US still regards the detention centre as an essential tool in fighting the war on terror. In May 2004 it opened Camp 5 - a $31m (£18m) two-storey maximum-security complex made of concrete and steel designed to hold 100 detainees, and is in the process of building Camp 6 - another permanent facility at Guantanamo that will reportedly hold 200 detainees. Earlier this month, the Pentagon said that following reviews, some 119 detainees would be moved from Guantanamo to their home countries and 14 released outright. But some 2,000 US military personnel are stationed at the camps, and while no new prisoners are said to have been taken to the camps for more than a year, officials say work to assess who detainees really are and what they know continues daily.